Nurturing Fibres - the Art of well dyed yarns. Nurturing Fibres have developed their dyeing methods over the last 12 years and dye variegated, mottled, self striping and semi solid colourways. Colour ways are inspired by nature, childhood memories, emotions, dreams and the good life in South Africa. The colours are sometimes bold and other times they are more muted. They hand select yarns to ensure they are the best quality merino wool, mohair and cotton available. They are proud of the high quality fibres that South African farmers produce, so [with the exception of cashmere] work with yarns that come from SA farms and are locally spun. Colour ways are dyed in small dye lots to ensure a high standard and uniqueness. "In 2005 I started to knit socks and began my quest for the perfect sock yarn. The colours/quality available locally were so disappointing that I realised I would have to learn to dye my own yarns. After a long search I finally found a wholesaler and began dyeing yarns for my own projects. Within the first month, I had to start selling to friends because I was dyeing more yarn than I could knit and did not want to stop dyeing. Soon I began supplying Orion Wool Shop and was enjoying my days, playing with colour. I chose the name Nurturing Fibres for my Indie dyeing label because I like the idea that I nurture colour into the yarn and then you, the knitter, crocheter, weaver then nurture the yarn into a garment. Finally the garment nurtures you and comforts you or your loved one." Enjoy the art of well dyed yarns! Solar power is used to heat the water used for dyeing Eco - yarn. The dyes used are certified and approved Oeko – tex. All the water is neutralized, ph levels are corrected after dyeing and then the water flows to an orchard of olive trees and is used for irrigation. Natural borehole water is used in the washing of the yarn. This has less environmental impact. 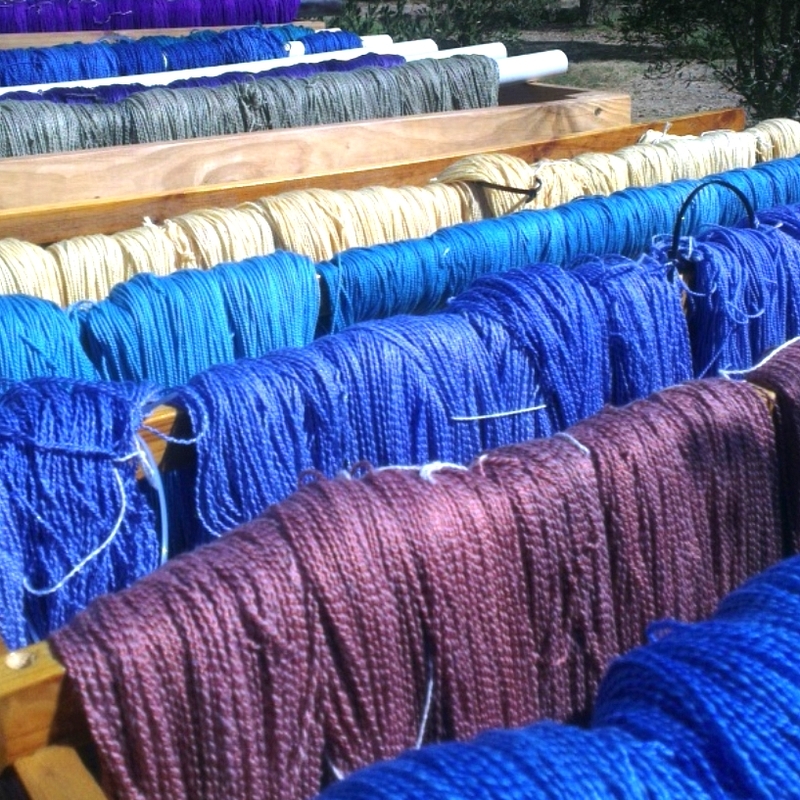 The Yarns are dried naturally outside in the sun- no fans/heated rooms are used, so no electricity. Skeining and balling is done on manual ball winders. 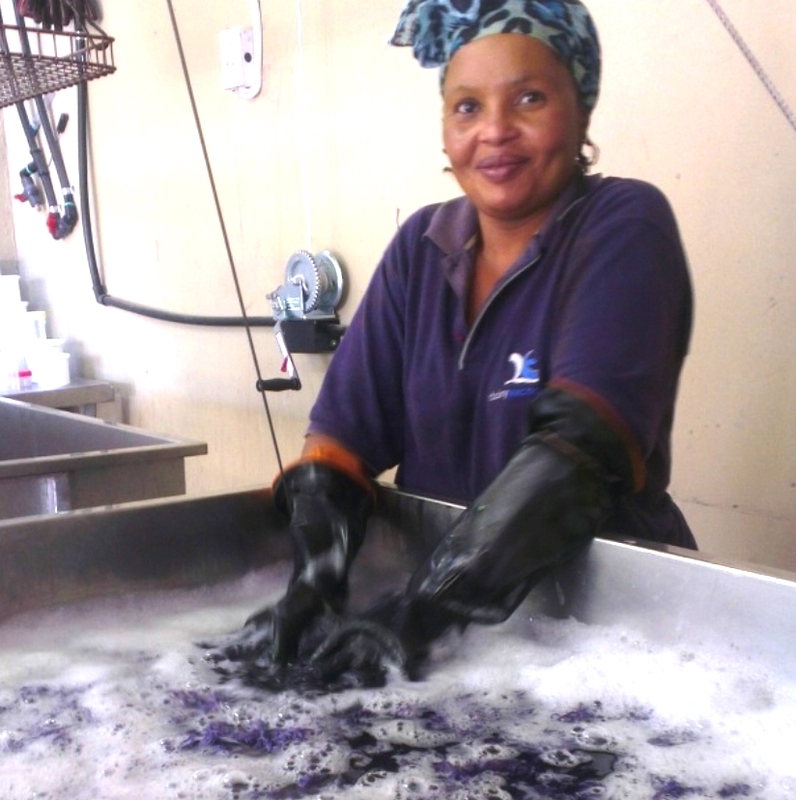 Nurturing fibers creates employment for 10 people from disadvantaged backgrounds. Above left: A dye bath holding tank. 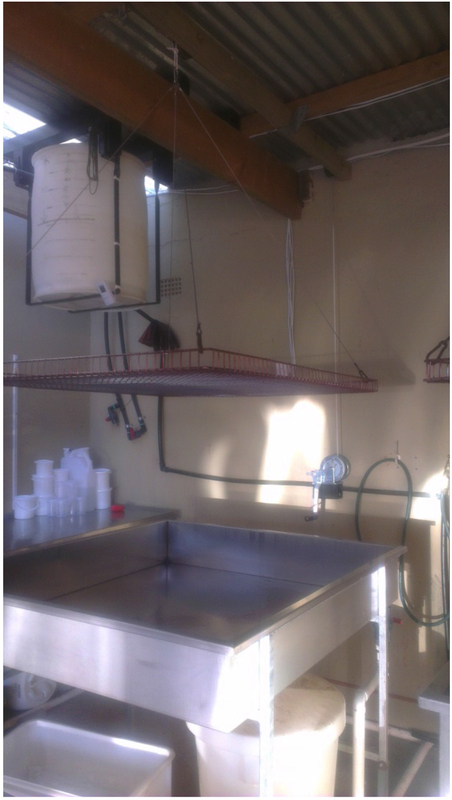 You can see the water tank that brings solar heated water via pipes from the roof to the dye bath. Above right: Yarn drying outside in the sun with olive trees in the background. Water from dye baths is used to irrigate the olive trees.